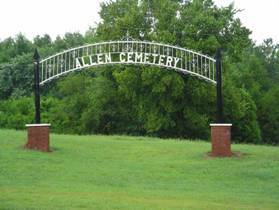 The Allen Cemetery lies northeast of Center Hill, Alabama. From Center Hill, travel east approximately nine tenths miles to County Road #470. Immediately after crossing Blue Water Creek, turn left onto Co. Rd. 470 and travel two tenths mile to the cemetery on the right. 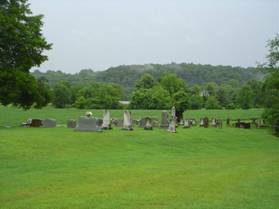 This cemetery has some very old graves. A few are unknown. Allen, Annie E.; b. 11 Nov 1878, d. 21 Oct 1900, daughter of L.H. & Eudora F.
Allen, Eudora F.; b. 19 May 1858, d. 16 Jun 1888, wife of L.H. Allen, Henry Davis; b. 11 Mar 1843, d. 02 Jul 1928, Sgt. Co “E” 27th AL Inf. Allen, infant; 22 Mar 1933, daughter of B.T. & V.J. Allen, infant; 31 Aug 1922, son of B.T. & V.J. Allen, infant; b. & d. 13 Jan 1896, son of L.H. & M.F. Allen, infant; b. 25 May 1913, d. 26 May 1913, daughter of W.T. & G.L. Allen, J. Henry; b. 11 Sep 1877, d. 14 Jan 1878, son of L.H. & Eudora F.
Allen, Manda C.; b. 20 Dec 1854, d. 28 Jul 1855, daughter of N.G. & Mary A.
Allen, Mary A.; b. 28 Oct 1825, d. 18 Aug 1896, wife of N.G. Allen, Maudie H.; b. 11 Dec 1886, d. 26 Jun 1887, daughter of L.H. & Eudora F.
Allen, N.G. ; b. 23 Jul 1819, d. 05 Apr 1878, husband of Mary A.
Allen, R.E. ; b. 25 Feb 1843, d. 17 Dec 1920, wife of Charlie P.
Allen, Tibitha; b. circa 1821, d. 18 Apr 1882, wife of B.T. Allen, Walter L.; b. 20 Apr 1912, d. 22 Sep 1913, son of G.L. & L.A.
Briggs, Adeline T.; b. 16 Oct 1857, d. 30 Jun 1935, wife of W.S. Briggs, Alma D.; b. 10 Aug 1899, d. 21 Jul 1900, daughter of W.S. & A.T.
Briggs, Annie B.; b. 04 Feb 1885, d. 12 Jun 1891, daughter of W.S. & A.T.
Briggs, Etta L.; b. 07 Jul 1879, d. 23 Sep 1879, daughter of W.S. & A. T.
Briggs, Henry D.; b. 22 Nov 1887, d. 09 May 1889, son of W.S. & A.T.
Briggs, John M.; b. 23 Sep 1877, d. 05 Mar 1881, son of W.S. & A. T.
Briggs, Mary E.; b. 10 Sep 1880, d. 06 Jun 1881, daughter of W.S. & A.T.
Pettus, M.J.; b. 11 Jul 1824, d. 07 Nov 1854, wife of W.W.
Phillips, infant; b. 02 Apr 1884, d. 04 Apr 1884, son of A.L. & M.L. Phillips, William Lee; b. 02 Apr 1895, d. 16 Jun 1895, son of A.L. & M.L. Wilcoxson, Margaret; b. 20 Sep 1829, d. 22 Jan 1854, consort of W.J.